Most scholarship applications ask a series of objective questions and follow-up with an essay. The essay is typically where you need to focus all of your effort because it is an opportunity to make yourself stand out in the minds of evaluators. Scholarship applications are tedious and require sincere effort that often yields no rewards, but if you receive one it not only makes college more affordable, it demonstrates drive and a competitive edge. Think of your essay as an academic sales pitch. Why should the scholarship fund or donor invest its money in you? Sometimes rethinking the purpose of the essay and your role in the process can motivate you to sit down and write something compelling. Write a New Essay for Every Scholarship – A scholarship evaluator will see right through a generic essay attempt. Programs typically award scholarships to individuals who can demonstrate certain qualities and provide a compelling argument. A nonspecific essay may come across as uninspired and will likely reflect a lack of effort. Jot down a few key points that you think hit home in each essay for reference, but remember to start fresh with each application. Read the Instructions – Read the instructions and follow them. Scholarship evaluators could be anyone given a set of criteria to evaluate. If you don’t follow the directions, your essay may not contain the criteria they scan for and may not get through the first couple of readings. When you have a clear understanding of the instructions, research the scholarship provider. Why does the program or organization exist? What have other winners written about in the past? Read through online information and supporting documents before you start developing ideas. Understanding where the scholarship grantors are coming from will help you find direction. Take Time to Brainstorm – You can start writing your essay right away but if you come up with a better idea halfway through the process, you may feel stuck with what you’ve already written. Instead, start thinking about your topic early on. Talk with friends and family about their perceptions, and jot down notes when they come to mind. If you carry a smartphone, write or record a simple note here and there. Find your passion. You don’t need a brand new topic to make your scholarship essay stand out. You do, however, need a compelling story. Search your life for meaningful experiences that connect with the essay topic. If you don’t have strong feelings about your essay topic, the content may come across as bland and unoriginal. Write an Outline – You may hate outlines and feel that they are unnecessary – write one anyway. Develop your main points with personal evidence (i.e. stories or incidents) that back up your claims. Take the time to write out as many points as possible, and make sure they relate to the topic at hand. Don’t worry about the introduction or the conclusion when you write the outline. Once you’ve written as many points as you can think of, go back and highlight the ones that stand out. Focus on these when you start writing. Remember to include a mix of experiences including awards, extracurricular activities, examples of problem solving, and subjective experiences. Write from the Heart, Edit with the Mind – When you sit down to write, let the story come out. Write from the heart and keep writing until you can’t think of anything else. If you chose a topic you are truly passionate about, this part should come naturally. Don’t worry too much about grammar and other writing conventions when working on your first draft. If you spend too much time, you may overthink your sentences and the tone of the piece may come across as dry or impersonal. Once you complete your first draft, take a break. Distract yourself for 5 minutes, an hour, or a day. Don’t think too much about what you wrote. When you come back to your essay, start at the beginning. Change sentence structure for readability and then check the overall flow. Did you start and end strong? Are your points clear? Did you use subtitles and paragraphs to create easy-to-follow idea separation? Find an Editing Buddy – While you may write unedited essays in class or during a test, you will rarely ever submit any unedited, formal piece in the real world. Even the best writers benefit from fresh eyes. As a writer, you may overlook simple grammatical mistakes. Similarly, what makes sense to you may not come across quite right to another reader. Ask your editing buddy to ask questions, make grammatical corrections, and share his or her experience while reading the piece, but always take an editor’s opinion on your content with a grain of salt. 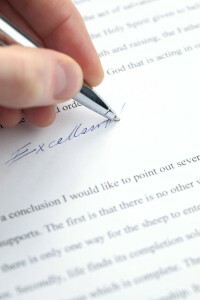 Essays are subjective, and you have the final say on what you submit. If you disagree with the feedback, ask another person to read over your essay. Never Wait Until the Last Minute – You will likely have enough last minute deadlines in the future, so start out your postsecondary pursuits without procrastination. Ask college graduates about their experiences. They’re either glad they spent time on finding and pursuing scholarships or they regret not investing enough time in it. Once you get into college, essays will become a norm, regardless of your career path. Consider scholarship essays practice for the real world, and get started on them early. Schedule time into your regular school week, take a week out of the summer, or start a scholarship group at school. Help fellow students research and read essays for non-competing scholarships. If you write together, you may all benefit from new ideas and writing approaches. When Should I Start Working on Scholarships? Many high schoolers make the mistake of waiting until late in their junior year or their senior year to start applying for scholarships. Experts highly recommend starting a search for scholarships as early as sophomore year. Applying for scholarships early on will improve your understanding of the process and what classes you may need to take to qualify for certain funding. If you get started early and submit your essay well before the due date, you may also receive priority when evaluators start reading through applications. Writing scholarship essays doesn’t have to feel like mandatory schoolwork. If writing isn’t your thing, you may also find local, national, and international scholarships that accept multimedia “essays.” When you work hard on an essay, remember to keep a copy of it in your portfolio. Since scholarship essays are often personal, you may be able to reuse the information later on in applications for specific study programs, research grants, or a job interview. With the right approach, you can develop a poignant scholarship essay that highlights what you have to offer while telling your unique story. Use these tips for scholarship essays and other writing assignments to give yourself a competitive edge and win your scholarships.